This isn't too exciting. 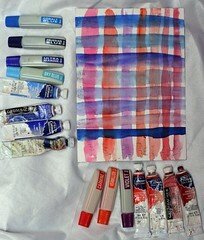 Just a little experiment to see how the different blues and reds look one wash over another. It also gives me a pretty clear idea which reds and blues are cooler and warmer than others. Motivation wise, i have a couple things to keep me busy and productive. Recently we learned one of our close friends has breast cancer, so i wanted to do something positive. I talked with my friend Darren Nixon who has a restaurant, Divine and some available wall space, so i talked with him about having a silent auction of my paintings to raise money to fight breast cancer. So i need to keep focused and get productive.